Website hosting solutions, and information technology (IT) solutions in general, have become ever more complex as the technology grows and matures. The successful design, deployment, and maintenance of a website hosting solution requires an IT partner with a unique combination of knowledge, experience and creativity. 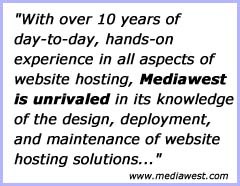 Below you will find those reasons which differentiate Mediawest as the website hosting solutions provider of choice for businesses and IT professionals. Unequaled knowledge and experience. With over 10 years of day-to-day, hands-on experience in all aspects of website hosting, Mediawest is unrivaled in its knowledge of the design, deployment and maintenance of website hosting solutions. Personal, one-on-one customer support. Tired of contacting your IT vendor's support line only to be connected with a "frontline" support representative who has never heard of you before, and who may or may not be located in this country? At Mediawest, customer service issues are addressed by a local, highly-qualified member of our staff who will personally know the nature of your account and issue, and will follow through until it is resolved. Objective evaluations of your technology requirements. Many website hosting companies advertise "exclusive partnerships" with other IT companies. These relationships may look impressive and can be very profitable for the website hosting company, but they do not necessarily benefit you, the customer. These companies often advise you to purchase products and services that they are obligated to sell, rather than those products and services that you actually need. Mediawest intentionally does not enter into any "exclusive" partnerships with a particular vendor so that we may provide to our customers objective opinions on the best solutions for their requirements. Carrier neutral facilities. Unlike other website hosting companies which are often "fronts" for large telecommunications companies, Mediawest provides hosting in only the best carrier-neutral facilities around the world. This means our Internet connectivity comes from multiple, redundant Tier-1 Internet backbones (multi-homed), rather than a single Internet backbone that most large telecommunications facilities offer. This results in unsurpassed connectivity uptime. Do not be fooled by hosting companies that advertise redundant connections and then require you to contract with a third party provider to bring a separate circuit into your cabinet as a "backup". This is not true redundancy and adds cost and complexity to your deployment. Let Mediawest provide true carrier-neutral and multi-homed connectivity for your Internet presence. We are team players. With a unique combination of technological and business acumen, Mediawest can work directly with executive management as an outsourced IT department, or with your in-house IT department as a valued and engaged member of your team. Using both collaborative technologies and good old-fashioned human response, Mediawest seamlessly integrates with all aspects of your enterprise. Custom service-level guarantees. The bottom line is that if we do not produce results, you do not pay us. These results are easily and clearly measured by performance and uptime statistics. Let us know how mission critical your application is and we will develop a custom service level agreement around that. Whether you need 99.9% uptime or 100% uptime, we can provide it and we will guarantee it. Privately held company. Today Mediawest is owned and managed hands-on by the original founders of 10 years ago. We offer a stable and secure future that our customers can count on. Unlike large telecommunications companies which change ownership on a regular basis, or even mid-sized hosting companies that are often backed by venture capitalists obsessed with the bottom-line, Mediawest focuses on long-term goals oriented toward our customers. The values and benefits listed here are only the beginning when it comes to communicating our commitment to our customers. We encourage you to contact us today so that we may meet with you and determine the best way Mediawest can help your enterprise become more efficient, reliable and cost effective.